In time for the 2nd year anniversary of the Philippines’s triumphant Arbitration case vs. China with the disputed West Philippine Sea, red – colored banners bearing the Chinese flag and Chinese characters with a rather provoking message saying, “Welcome to the Philippines, Province of China” were conspicuously hanged around several footbridges in Quezon City. With vague motives, Malacañang, on Thursday, issued a statement saying that the “enemies of government” were behind the malefaction that irked many social media users. Presidential Spokesperson Harry Roque Jr. expressed his opinion at a news conference, saying: "It’s absurd and I’m sure it’s the enemies of our government behind it. So to them: try again, you need a better gimmick than that." "Nagpo-provoke lang po siguro iyan. They are obviously propagating a lie that we have given up on our national territory. It’s farthest from the truth," Roque said. "We continue to assert our sovereignty and sovereign rights. But we decided to move on issues which are non-controversial because we know that the final resolution particularly on the issues of sovereignty on the disputed islands will take many, many, many years to resolve since this was not a subject of the arbitral ruling that we won two years ago," Roque added. 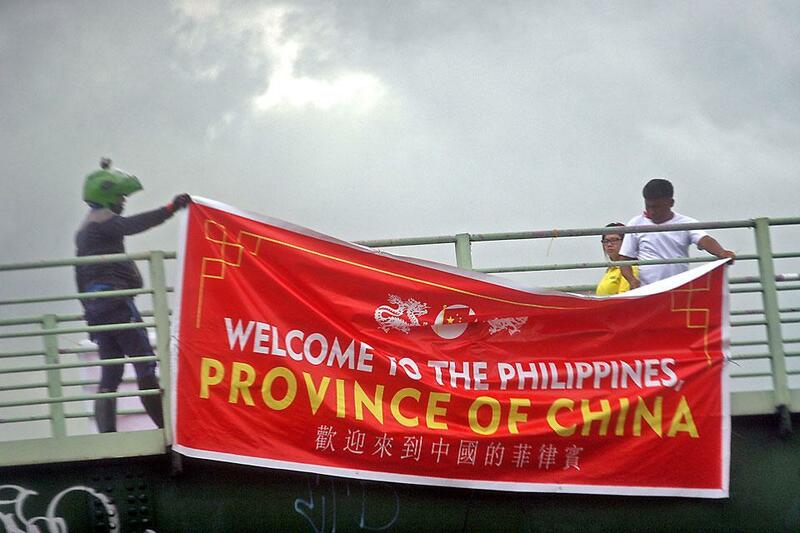 The banners’ message was a strong reference to the President’s joke in February about Philippines becoming one of China’s province. ‘Smarter’ Chinese Ambassador to the Philippines Zhao Jianhua however, defended the President’s joke as a reflection of an even stronger ties between the 2 countries coming from a rough patch when former President Aquino took the Arbitration case to court. 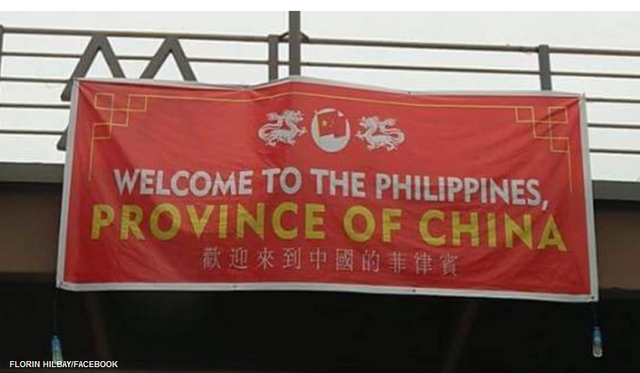 Quezon City government has now ordered Public Safety officials to take down the banners in their respective areas while the Palace has opted to let the issue die down and focus on bettering political and economic ties with China.